Smith Flat Animal Hospital is a well-established, full-service, small animal veterinary hospital providing comprehensive medical, surgical and dental care. We have been in the same location serving Placerville, Camino, Pollock Pines, Shingle Springs, Cameron Park and the foothills for more than 2 decades. We provide a broad spectrum of diagnostic procedures through in-house testing and the use of external laboratories. Many tests can be performed immediately in-hospital, but if your pet needs special tests, we have twice daily lab pick-up with results faxed back quickly. We also work closely with local specialists when special diagnostic or treatment procedures are required. The facility includes a well-stocked pharmacy, in-hospital surgery suite, in-house x-ray capabilities, dedicated dental x-ray, a closely supervised hospitalization area, and indoor boarding kennels with outdoor walking areas. 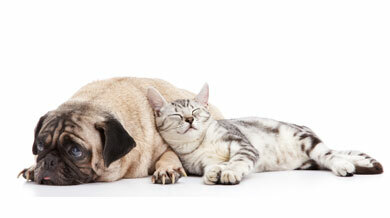 At Smith Flat Animal Hospital we treat your pet like our own. Our job is not only to treat your pet when he or she isn't feeling well, but also to help you learn how to keep your best friend happy and healthy.